Do you have a business or news website? Looking for the proven strategies to improve your online visibility and income? The success of a website depends on several factors including keyword research, SEO, quality of backlinks, and competitive analysis. Find the trending keywords in your niche and read similar articles that appear in the top of the search results. Produce better content on your website with more target keywords and relevant links to make it search-engine friendly. Search engine optimization and link building are other major factors that influence the growth of your business. 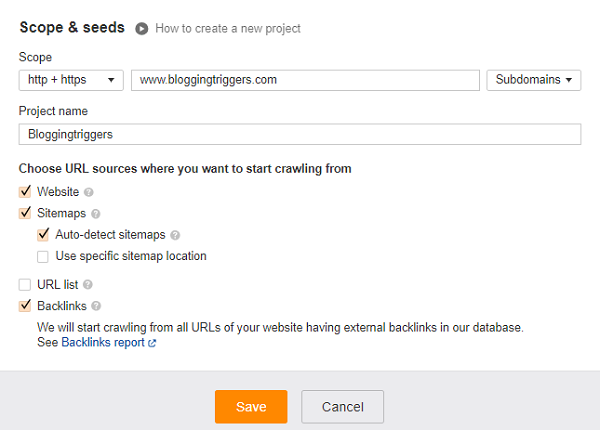 Build backlinks from top-authority domains to inform search engines about the value of your posts. Fix your internal page issues to improve the ranking of your website. Analyze content creation, marketing, and link building strategies of your competitors to know what you are missing. Fill the loopholes to enhance your online presence and win over the competitors. But these things are not easy as you may think. An intelligent SEO tool is required to analyze your own mistakes and steal your competitors’ strategies. It can monitor your website for SEO and keep an eye on other websites for growth hacking. Ahrefs is a great all-in-one tool for keyword research, competitive analysis, SEO, and link building. In this post, we’ll tell you how to use Ahrefs to improve your search engine rankings and page visits. 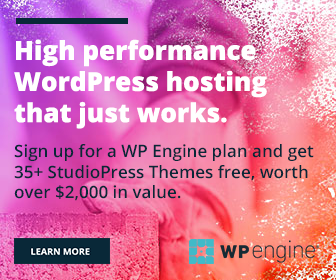 Ahrefs is a great tool to supercharge your SEO in 2019. It allows you to track backlinks of any website, organic keywords, organic traffic, and most popular pages in a few moments. You can also use it to monitor keyword rankings and run keyword research, and SEO audit of your own site. Ahrefs has a really huge database of live webpages and backlinks. Their integrated tools update the data very often to deliver the most accurate results to the users. It also lets you analyze the PPC keywords and ads of your competitors, so you can design marketing strategies more effectively. Do you want to explore search trends on multiple search engines like Google, Bing, Yahoo, and even YouTube? Ahrefs provides powerful statistics of any keyword with keyword difficulty, search volume, CPC rate, and similar keyword ideas. Google is selected as the default search engine and the United States as the target location. Click ‘New list’ button to create a list and enter the required keywords that you want to research. 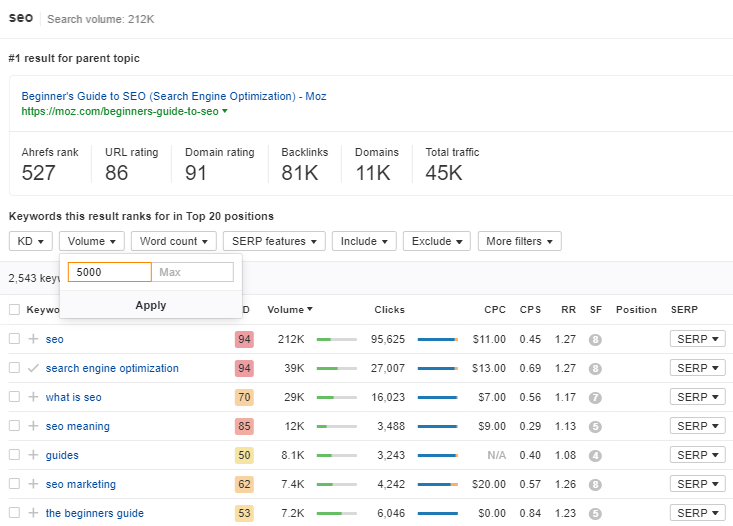 Ahrefs will show the keyword difficulty, search volume, number of clicks, and click rate for each of them. Click the parent topic to explore each keyword in detail. Find keyword phrases and similar search terms on the new page. You can filter the results based on various factors like keyword difficulty, search volume, word count, SERP, and many others. Include or exclude some keywords from the results if needed. For eg, you want to find ‘how to’ posts on the subject. Choose the ‘Include’ option and enter ‘how to’ in the text box to display only how to post keyword ideas. Type a minimum search volume to detect keywords people are searching for. Enter a maximum keyword difficulty to get low-competition post ideas. SEO audit is a key feature of Ahrefs. Scan your website for issues relating to SEO and overall performance. It will give you detailed reports on internal pages, broken links, HTML tags, and many others. So you can identify mistakes easily and rectify them to improve your search engine presence. Click ‘Site audit’ from the top of your Ahrefs account. Enter your website address and save. Ownership verification is essential to explore the website in deep. Place the given HTML tag in your theme header to prove the site belongs to you. Within a few minutes, you will get reports like this. It will list URLs and images having issues, slow speed pages, broken links, redirected pages, etc. Open relevant contents and make necessary modifications to boost your website’s health score. Ahrefs is one of the best competitive analysis tools to identify new content creation, link building, and paid search opportunities. It allows you to analyze competitors’ backlinks and ways of earning them. Know the quality of referring pages and how much traffic they receive. Filter the results by link types, platform, language, and traffic to find their hidden strength. Enter your competitor’s website address in the search box to explore their backlinks, referring domains, organic keywords, and PPC keywords. Tap ‘Backlinks’ from the left pane of your dashboard to view their new, lost, and broken links. Click ‘Link type’ drop-down menu to track Dofollow, Governmental, Educational, and Content links to your Competitors’ pages. Tracking organic keywords is another notable feature of Ahrefs. It will inform you about the keywords that divert traffic to your competitor’s website. Click ‘Organic keywords’ from the left side of your screen. 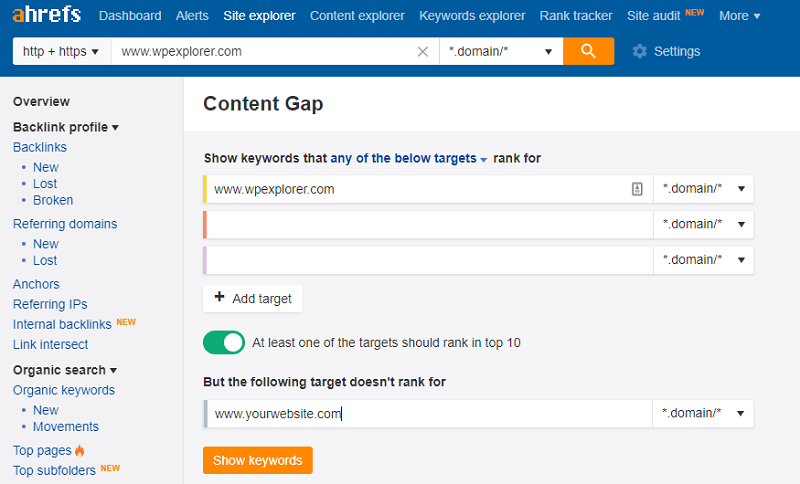 Ahrefs will scan the site and display organic keywords of the given domain along with the total search volume, keyword difficulty, CPC, traffic, and position in the search results. Use ‘Keyword Difficulty (KD)’ option to find low-competition keywords. Filter the results again using traffic and CPC parameters. Now you will see the most profitable and trending keywords on the page. Create SEO friendly contents on the subject and build backlinks to them from the top-tier domains. Promote them through social media marketing, email marketing campaigns and if you have money to spend, use PPC campaigns also. ‘Content gap’ is another Ahrefs feature I love. It will show the content gap between your website and a list of competitive sites. Choose ‘Content gap’ from the left pane of your Ahrefs dashboard. Enter your competitive websites one by one under Show keywords that any of the below targets rank for’ menu. Enter your website name under ‘But the following target doesn’t rank for’ and hit Show keywords button. Ahrefs will compare your website with others and let you know where you miss.